Back again for the first time! °Flash back with me, if you will, to a time when handsome, brave, wide shouldered, square jawed, homogenized white guys made the universe safe for all mankind. Heroes such as Captain Video, Flash Gordon, Tom Corbett and Buzz Corry came to the rescue every week, thrashing bad guys and thrilling youngsters across the land. From out of that Wonder Bread World we bring you Little Bucky Jones – Space Cadet! 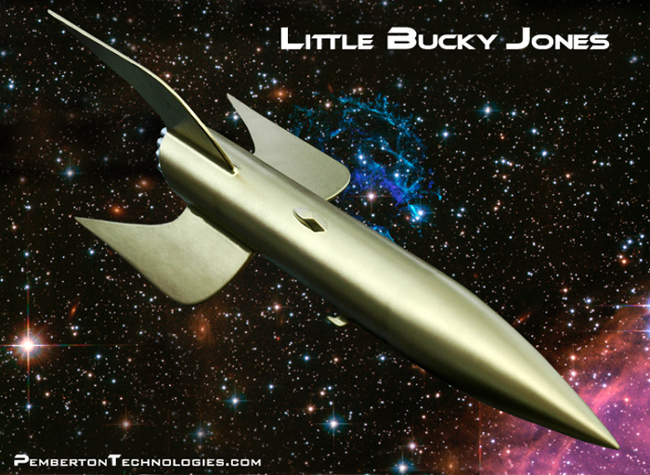 From his bulbous nose to his flashy fins and multiple exhaust tubes, Little Bucky Jones is Super Retro Sci-Fi through and through. Like all spaceships from that era, he is gaudy, stylish, sleek and silly enough to give aerospace engineers apoplectic fits. Kit comes complete with a premium balsa nose, body tube, 24mm motor mount, heavy-duty centering rings, laser cut 1/16″ ply wings, fins and nose probes, parachute, 60″ KEVLAR shock cord, nose ballast, 1/8″ launch lug, balsa canopy material, Super Retro Exhaust Tubes and our infamous Destruction manual.